David’s interest in woodworking began when he entered 7th grade in Bolton CT., influenced by Roger Titus the industrial arts teacher at the then Bolton Junior Senior High School. Two years later the school became only a High School which kept David under Rogers’s guidance and influence for 6 years until he graduated. After High School David furthered his education at Manchester Community College and Hartford State Technical Institute, as well as taking several courses with the Architectural Woodworking Institute. From 1977 – 1979 David moved to Ghana (West Africa) to work as a volunteer in the Peace Corp. Working for Forest Products Research Institute (FPRI) on the campus of the University of Science and Technology, David managed the construction division at FPRI which consisted of a woodworking shop as well as a division that provided light construction for the Institute’s research nursery and other divisions. While in Africa David traveled in 13 countries and hiked to the summit of Mt.Kilimanjaro (19,340’). Upon returning to the U.S. David took the summer of 1979 off and embarked on a 9,000 mile motorcycle trip around the United States. 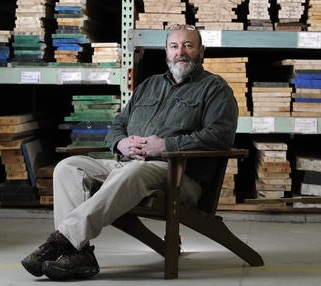 After returning to Connecticut, David purchased a pickup truck and a skill saw and began his woodworking career. The rest is history as they say. David is married to his wife Rebecca and has 3 sons, Gregory, Brendan, and Ryan. In his spare time David enjoys spending time with his family, camping and traveling, as well as golf, fishing, gardening, and collecting vintage woodworking tools and coins. Bob joined the Parkerville team in June of 2013 and brings with him over 36 years of diverse accounting and financial management experience. He earned his degree in Accounting at Central Connecticut State University. Bob has had the good fortune to work in divisions of Fortune 500 companies as well as in several closely held family owned businesses during his career. He is responsible for all Accounting, Administrative and Human Resource functions at Parkerville. Bob worked with David previously at Harris Woodworking from 2000 – 2008 so he is a seasoned veteran in the industry. Bob & his wife Pat have a daughter Lindsay. In his spare time Bob enjoys entertaining and spending time with family and friends, working out, golfing and skiing. Bob is also in the process of restoring his first car that he has owned since 1970, a 1965 Mustang GT fastback. Paul began his professional woodworking career in 1992 in the shops of cabinet and furniture makers. In 1997, he decided to incorporate his educational background in drafting and engineering with his career and made the move from the shop floor to the office, taking a millwork detailing position at Harris Woodworking working for Dave. Following his time at Harris, Paul became a freelance millwork detailer with accounts from across the United States. After several years, and looking for a new challenge, he again began to work exclusively for a commercial casework and millwork company in central Connecticut. Successfully running the engineering department there for 10 years, as well as, learning to use several industry specific software platforms currently being utilized at Parkerville, Paul is now returning to work with Dave at Parkerville to share his expertise and build upon its success. When he’s not working, Paul enjoys outdoor activities with his family, traveling, and is an avid follower of the Pittsburgh sports teams. Rob joined Parkerville in May of 2013 bringing over 20 years of experience in custom mill work design, sales and marketing for a local lumberyard. His education in woodworking began by attending Howell Cheney Tech, a local state high school where he graduated from their carpentry program. From there he earned a double major in Management and Marketing at Saint Joseph’s College in Maine. In addition to Rob’s duties in sales and marketing, he is also responsible for our purchasing and enjoys greeting our customers as they enter our store. He is also a previous employee of Harris Woodworking managing the specialty retail business there from 1993 – 1997. Rob enjoys family camping vacations with his wife Michelle and 2 children, James and Jacquelyn. In his spare time Rob volunteers at a local railroad museum, is involved in Boy Scouts and supports the marching band program for the high school where his children attend. He also enjoys music by playing the piano, keyboard, and organ. Matt has been with Parkerville since December 2007 and is responsible for servicing our everyday customer’s needs. His professionalism, patience and expertise make him ideally qualified to fill this key role within Parkerville Wood Products. Matt has extensive previous woodworking experience having worked for several years in other woodworking shops and the mill of a large local lumber yard. He is married and outside of Parkerville enjoys working around his home, canoeing, listening to music and playing the guitar.